THE EAGLE CLAW TREBLE This hook is the finest treble made. Used for large baits as well as upgrading lure hooks, it is forged for strength and manufactured with micro-ground points. This hook is perfectly tempered and brazed for strength. Eagle Claw utilizes over 12 different finishes among all families of hooks. This hook is the finest treble made. Used for large baits as well as upgrading lure hooks, it is forged for strength and manufactured with micro-ground points. This hook is perfectly tempered and brazed for strength. 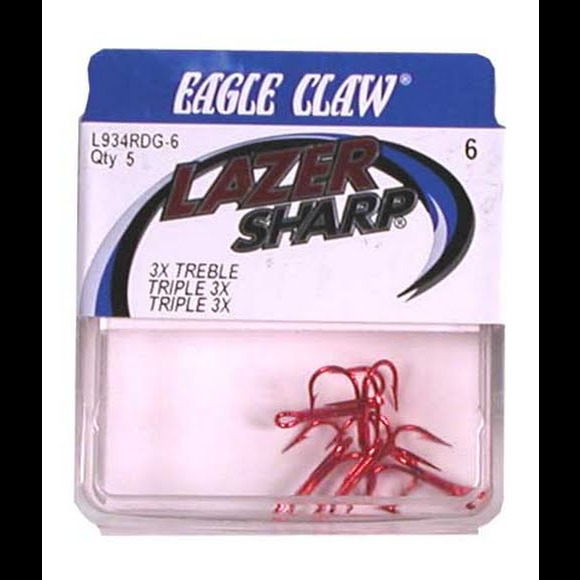 Eagle Claw utilizes over 12 different finishes among all families of hooks. Beginning with Bronze and ending in Stainless Steel there is a finish for everyone, every fishery, every bait, and every style of fishing. The Eagle Claw scientists are continually reaching far beyond the basics to bring the world market the best finishes available. Fishhooks are the vital link between fish and anglers. The hook performance directly relates to fishing success. Fishhooks seem simple at first glance. They&apos;re the least expensive part of the angler&apos;s equipment, yet in many respects they are the most important. A fishhook is made from a length wire that is ground and bent to form a hook. 90% of all hooks have most of the following features: point, barb, eye, shank, offset, slices, gap, bend and bite. Made in USA Eagle Claw hooks have been built in America for over 80 years. The only American made fishhook is still being turned out by the millions at the factory location in Denver, Colorado. American-made hooks built by American anglers for the world market.